Rachael is an inspiring young female speaker with an ability to capture anyone's heart and imagination. Her personal and honest story of overcoming anorexia, anxiety and depression is both powerful and thought-provoking.She delves into the darkness we all sometimes face, emerging to show that anyone can overcome adversity. 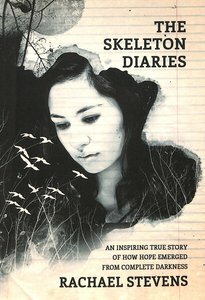 Customer Reviews For "The Skeleton Diaries"
Rachael Stevens shows immense courage in letting the world into her most private thoughts and feelings. This is an extremely raw account of what is is like to be a person living with a mental health issue. All parents of teenagers and those in the medical profession should read this.. Especially those that deal with people who have mental health issues. Rachael highlights just how imperative it is to treat those suffering with kindness and gentleness rather then as a disease or illness. I commend Racheal for getting through what she did, and for her willingness to help others by opening her darkest thoughts to the world.